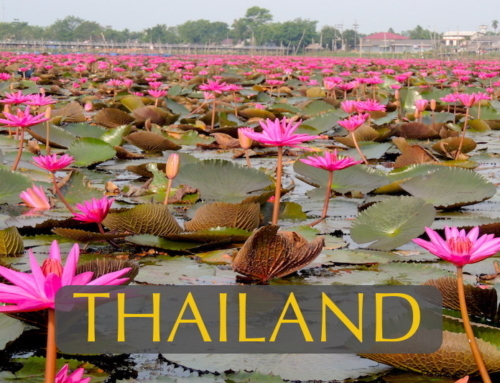 This adventure explores a little visited region of the Thai Kingdom where the foothills of the Himalayas, forested waterways and rice-terraced valleys combine to create the most idyllic landscape in the country. 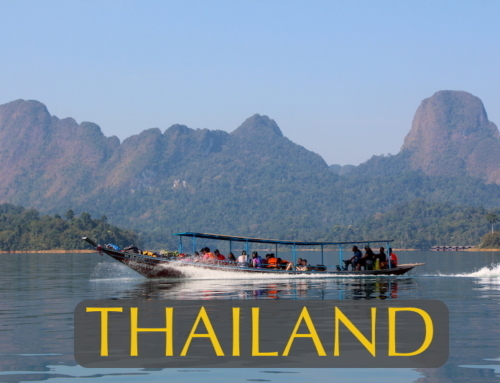 Here too is Thailand’s greatest diversity of cultures – Hill Tribe peoples from Burma, China, Tibet and Laos – all living according to time-honored traditions in small hamlets nestled in the mountains. 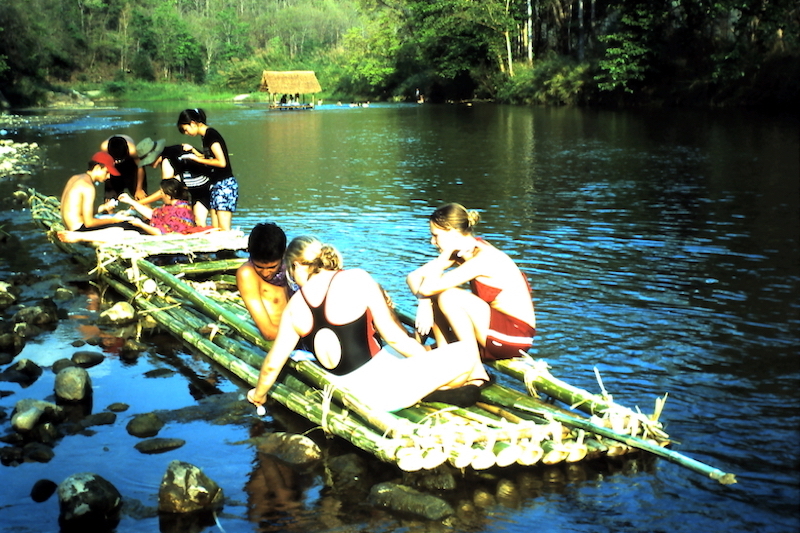 Students on this trip will visit stunning waterfalls, engage in stream studies, explore prehistoric caves, be challenged during a 2-day wilderness rafting expedition down the Pai River, visit the scenic Burma border town of Mae Hong Son and work to assist Hill Tribe peoples on a service projects they identify for themselves. 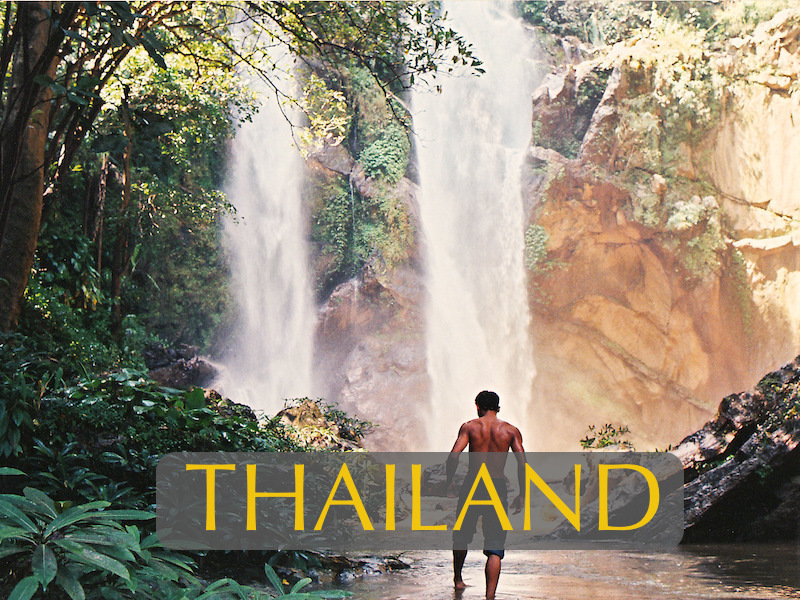 Near Chiang Mai we will hike through a magical cloud forest atop Doi Inthanon National Park – Thailand’s highest summit, and rejoice under some of Thailand’s most majestic waterfalls. Chiang Mai and Lampang are ancient centers of Lanna culture where we will visit ancient temples by horse and buggy, dine in Lanna style and enjoy shopping for traditional crafts of the highest quality. Thailand’s Northern Treasures offers a wealth of experiences at a pace that will allow all who take part to find that quiet place within. That’s the real treasure of the region. 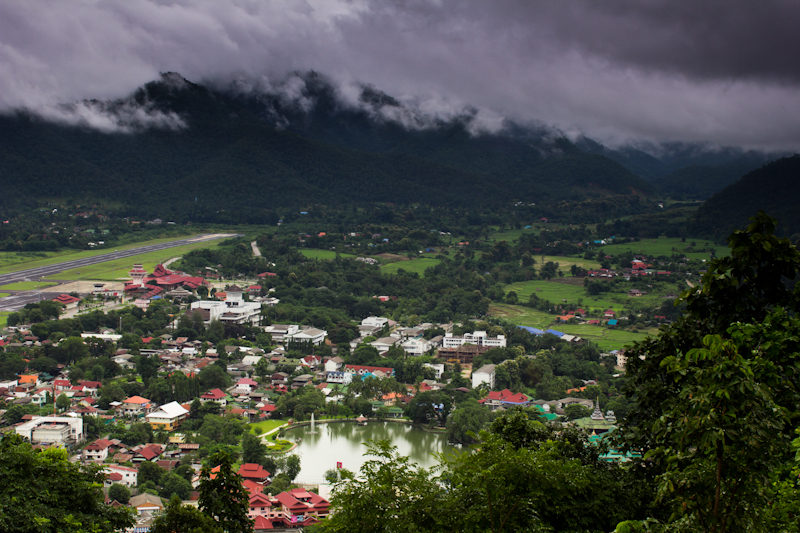 Students arriving in Chaing Mai on a morning flight will be greeted at the airport by our staff and transferred by mini vans a short distance to Doi Suthep. Doi Suthep, with its lofty temple overlooking the city from 3,600 feet above sea level, is Chiang Mai’s feature attraction. The temple, established in 1383 by the Lanna King KuNa, is reached by climbing 290 steps up the Naga (Dragon Head Serpent) staircase. The glittering pagodas, temple bells and stunning vistas make it worth every bit the effort. Just a short walk from our camp is the beautiful Mork Fa waterfall where students can spend the afternoon enjoying a refreshing swim and doing a biotic and abiotic analysis for stream quality. 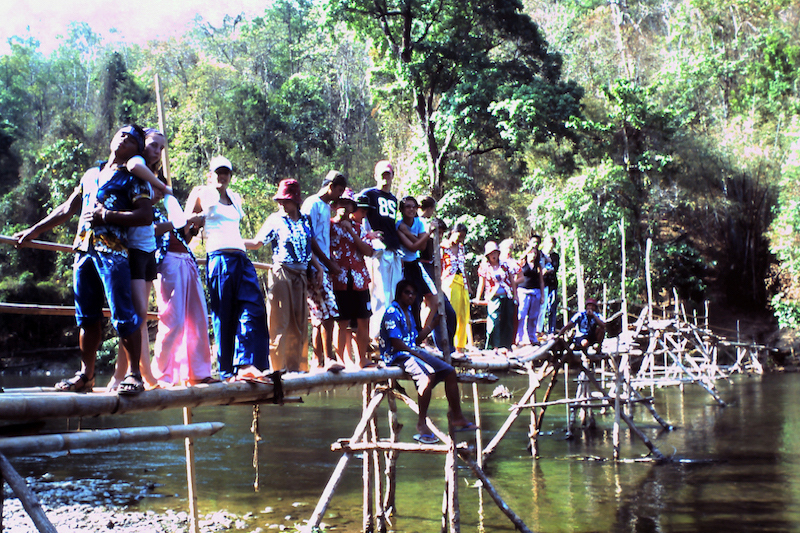 This evening after dinner, students will have a talk on Northern Thailand’s rich natural and cultural history. Students rise early this morning to identify birds in and around our camp at the time of day they are most vocal and active. After a good breakfast, we drive several hours to Cave Lodge where we will check into our rooms, enjoy a swim in a nearby stream and a delicious home cooked lunch. We now set off on foot and by bamboo rafts to explore Tham Lod, an amazing cave passage with a river running through it. Tham Lod has huge chambers filled with spectacular limestone formations and 1,600-year old prehistoric coffins and cave paintings buried deep within the chambers of the cave. Towards evening we will hike a forest trail to the far end of the Tham Lod cave passage in time to watch an incredible wildlife spectacle at sunset. More than 300,000 Fork-tailed and Pacific swifts swirl into the massive exit chamber of Tham Lod just before an equal number of insectivorous bats exit. 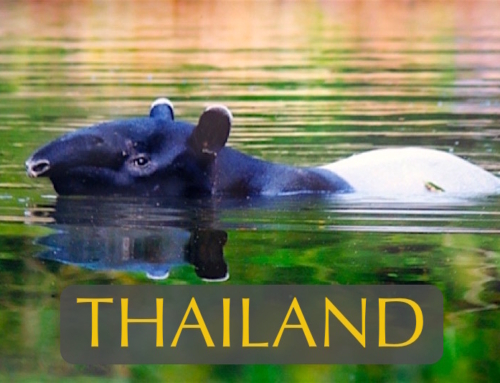 It’s one of Thailand’s most awesome wildlife spectacles. In the beautiful natural setting of Cave Lodge, we will enjoy a casual family-style dinner and a group-sharing circle around the fire. Departing Cave Lodge early after breakfast, we drive to the idyllic village of Pai where we can explore the region by bicycle before lunch. Pai has become quite a haven for Thai artists and foreign tourists so there is a great range of restaurants where we can take our lunch before starting our 2-day river rafting adventure. After driving to the put in point for our rafts and having an extensive safety briefing, we join the flow of the river. 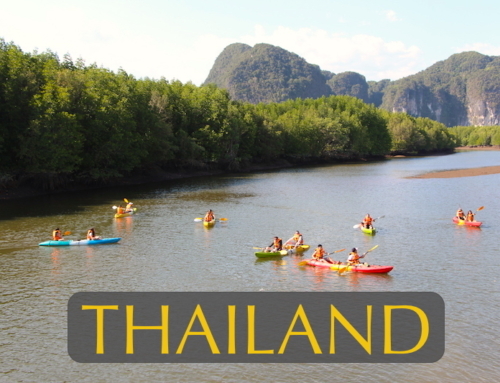 The Pai River passes through pristine wilderness with gorges, waterfalls, riparian wildlife and the best rapids in Northern Thailand. Along the way, students will learn principles of river hydrology, observing effects of river erosion, and learn of the flora and fauna of the riparian zone. Towards evening, we set up our camp and enjoy dinner and stories around a wilderness campfire under the stars. Everyone will rise early to watch the sun rise over the river and wash up before breakfast. After breaking camp we continue our river run down the beautiful Pai River all the way to Mae Hong Son near the Burma border. After two days on the river and a night in a bush camp everyone will be ready for the beautiful resort we check in to on the outskirts of Mae Hong Son. After lunch at our lodge, students can enjoy a large outdoor pool until late afternoon when we go to explore the charming Burmese-style temples and town of Mae Hon Song. 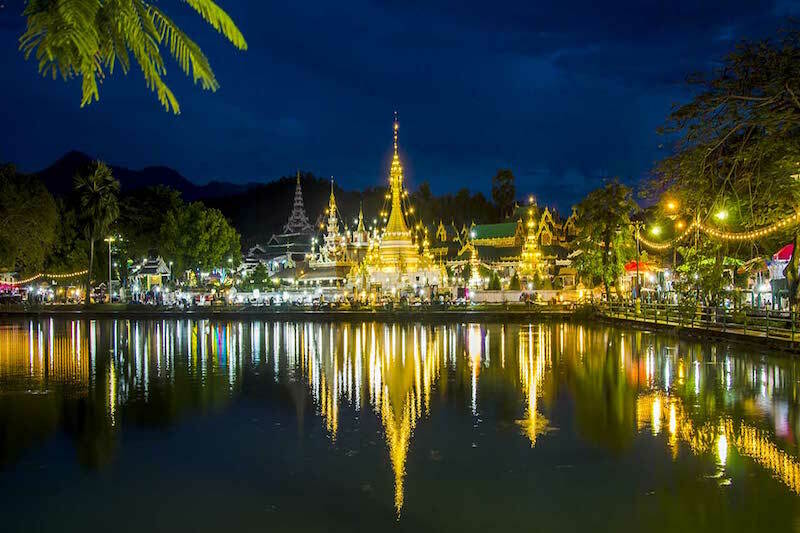 We will watch the sunset from a hilltop Shan-style temple overlooking the city and see why Mae Hong Song is called ‘the land of many mists.’ We will then descend to town to enjoy a delicious Shan-style dinner at a popular restaurant. Before returning to our resort there will be time to walk around the scenic lake in the center of town and shop for handicrafts from many street vendors and shops. Right after an early breakfast at our lodge, we drive an hour to a village of ‘Black Lau’ so named because of their black traditional dress. Originally from Tibet, they still live a basic life according to their traditions and are regarded as the most outgoing and friendly of the Hill Tribe peoples. Our guide on this trip is from this village so we will feel right at home as we visit the village school and engage in a full day service project. Surrounded by majestic cliffs this village experience will be the most authentic of its kind. Our special invitation from the Deputy Village Head Man is our ticket into the real life of the Black Lahu Hill Tribe. Landing in Chiang Mai, it’s a one-hour drive to Lampang where we will stop for lunch before continuing on another hour by mini van to Doi Inthanon National Park. 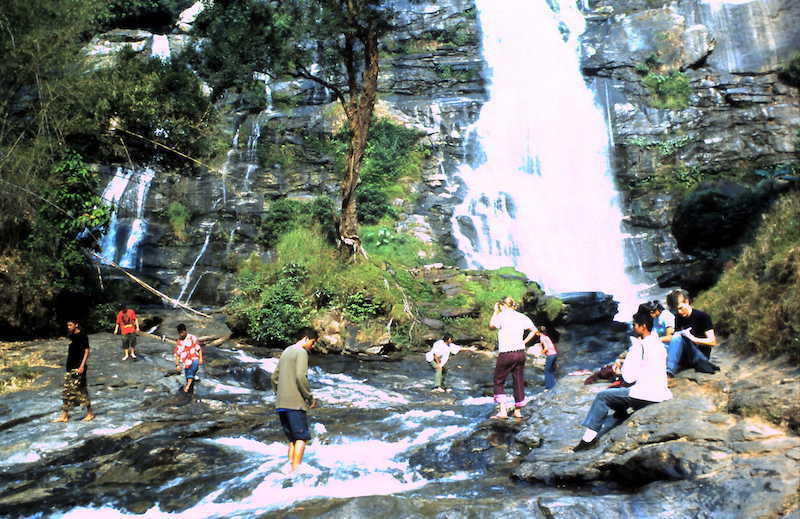 Here in the delightfully cool climate of this high elevation park, we will visit some of Thailand’s most beautiful waterfalls and learn about ‘montane’ forests. 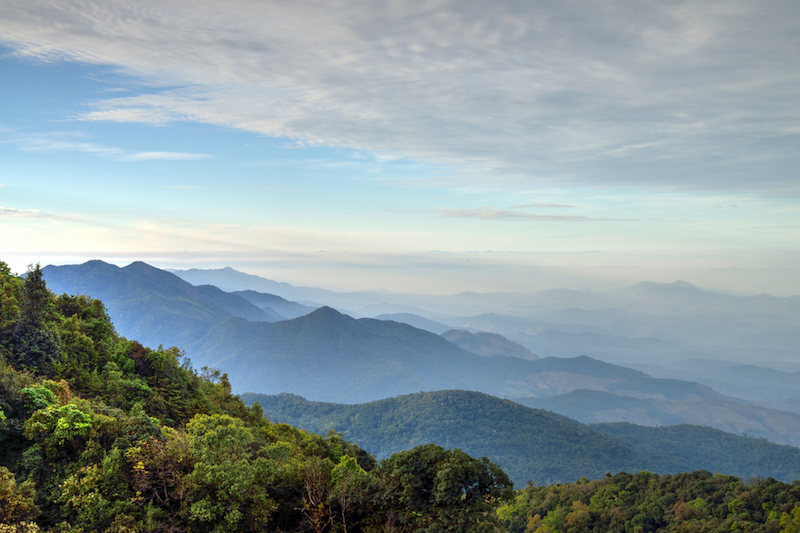 Today is a nature lovers dream as we set off early for Thailand’s highest peak, the mist-shrouded Doi Inthanon. This 2,565 meter high summit is part of a 500 square kilometer national park and home to the highest bird diversity in the kingdom – a staggering 400 plus species living on a single mountain! 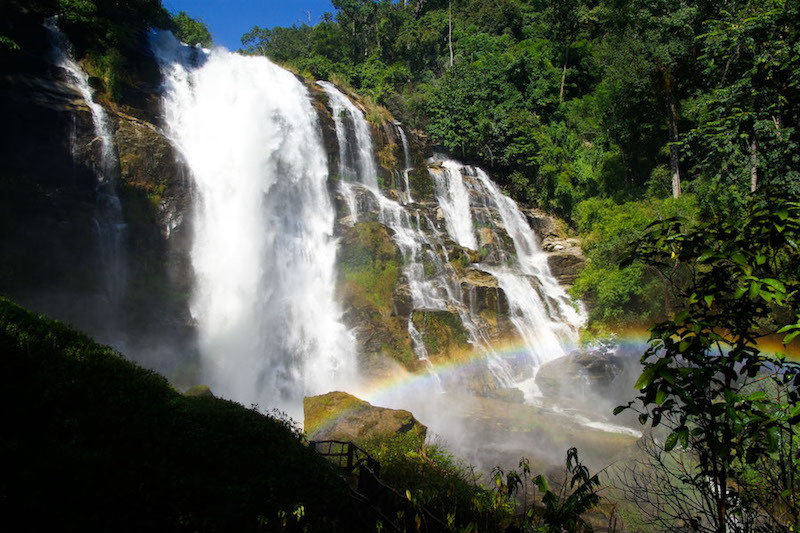 During the journey to the top of the mountain we will stop to view some of the country’s most beautiful waterfalls: Mae Ya waterfall (250 m. high), and Vachiratam waterfall (the most impressive of all). A long plume of spray falling down a cliff face glistening with ferns and moss-covered boulders indelibly etches this scene forever in ones mind. 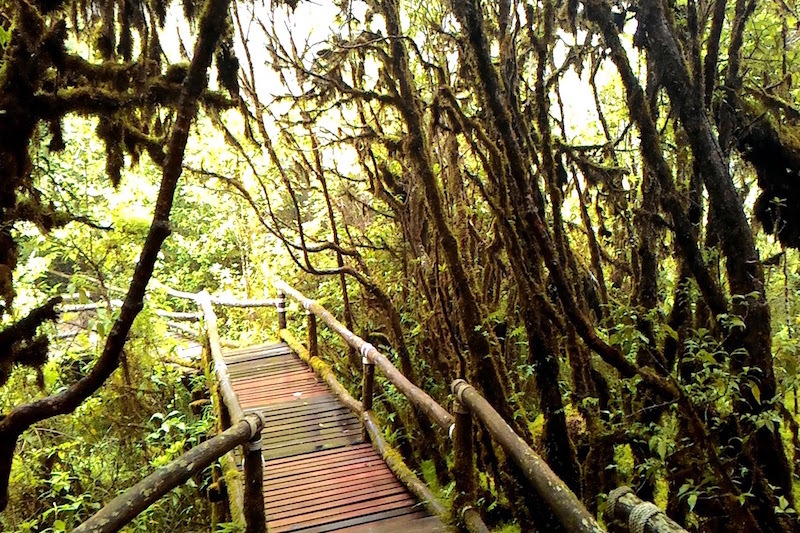 Near the summit, we will hike the Aangka Nautre Trail – a raised walkway leading over a sphagnum bog and into a forest wonderland of huge trees smothered in mosses and epiphytes. This is classic ‘cloud forest’ an excellent area for bird spotting with babblers, rollers and leaf warblers especially abundant. Descending from Doi Inthanon’s lofty heights we stop for a picnic lunch at Mae Klong waterfall before winding our way back to the lowlands and two ancient centers of Lanna civilization: Lamphun and Lampang. 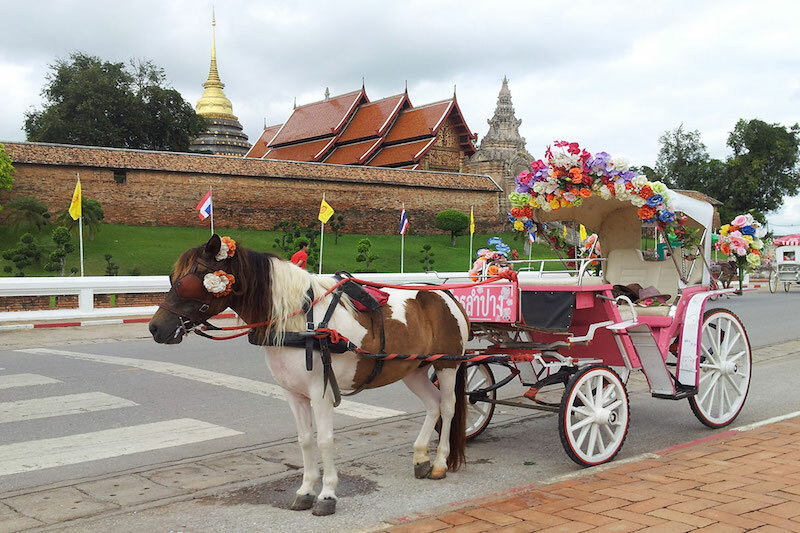 In addition to the ancient temples of these sites we will enjoy a horse carriage ride through old Lampang before sunset. Tonight is our final night together and we will commemorate it with a traditional Lanna-style dinner and a beautiful closing candle circle where each person can reflect back on highlights of our journey together. All too soon our journey has come to an end. Right after breakfast at our hotel we pack up and drive back to Chiang Mai International Airport for the flight to Bangkok and homeward connections.